There will be a service of welcome in Gloucester Cathedral on Saturday 11 March, 4.30pm. for the new Archdeacon of Cheltenham. 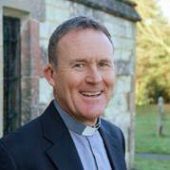 The Revd Canon Phil Andrew will work closely with the Bishop of Gloucester and her senior staff team in the leadership of the diocese. The role also involves supporting and working with all clergy and lay people in Cheltenham and the Cotswolds. Phil will come to us from Surrey, where he is currently the Vicar of Reigate Parish Church. He is married to Sue who is a GP and they have three adult sons, Tom, Dan and Josh. Phil was born in Kenya, but returned to England to attend secondary school. He studied Mechanical Engineering at Nottingham University, which was followed by 16 years mainly working as a Chartered Engineer in the UK water industry, before he was ordained in 2002. In his spare time Phil tells us. “I have the travel bug and enjoy travelling and exploring different cultures, especially when combined with walking and trekking. I enjoy a variety of sports, though increasingly from the armchair or terraces! I enjoy running on a regular basis and have recently taken up cycling. Phil will be licensed and installed as Archdeacon at a service in Gloucester Cathedral on Saturday 11 March, to which everyone is invited.